Hay is dried forage vegetation used as feed for horses, cattle and other livestock during the winter months when green pasture is not available. Hay is also used as feed and bedding for many small animals such rabbits and chickens. Most hay consists of either legume crops, like alfalfa or clover, grasses, or a combination of both legumes and grasses. Hay grasses vary in different regions of the country. Bermudagrass and bahiagrass are two common hay grasses grown in the southern United States. According to the Mississippi State Cooperative Extension Service, bahiagrass grows easily, producing large quantities of hay, but its feed quality is not as beneficial as that of bermudagrass. Bermudagrass produces a nutritionally superior hay under hot, moist southern growing conditions, but may require additional management such as weed treatment. Crabgrass--the bane of gardeners trying to maintain an attractive lawn and perennial beds--has the potential for the highest protein rating of any of the hay grasses, according to the Oklahoma State University Extension. Bluestem is a native prairie grass more often grown for erosion control than for hay, but the Oklahoma Extension advises that it has moderate nutritional potential if properly managed. Fescue is the most common lawn grass in the United States, and it is also grown for hay in some regions. While the Oklahoma Extension lists fescue as having a moderate forage nutritional profile, the Kentucky Cooperative Extension advises against using it as a feed hay, as a symbiotic fungus within the fescue has a negative effect on some animals. 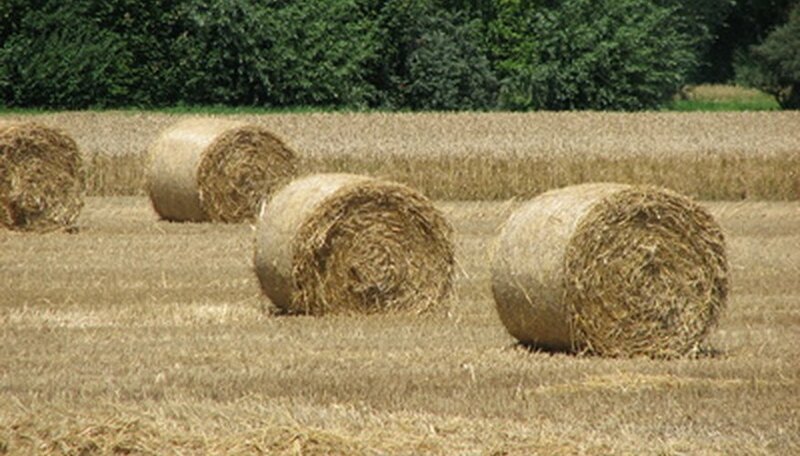 The Kentucky Extension also states that horses are likely to waste considerably more fescue hay than other types of hay. According to the University of Kentucky Cooperative Extension Service, the most popular grass hay choices for horses are Timothy and orchard grass. Timothy is a European native grass transplanted by early colonial settlers and it has now become ubiquitous in American fields and roadsides. Orchard grass can be used for fresh pasture or dry hay, and many horses prefer its sweet taste. Wheatgrass and ryegrass hays have similar nutritional profiles to orchard grass, depending on management techniques and seasonal weather differences, according to the Oklahoma State University Cooperative Extension. Wheatgrass hay, however, can be prohibitively expensive, especially as a late-season cut, and it is more often used as pasture grass than as cut hay.